IoT is what the personal computer was in the 1980's: Everyone is talking about it, but who can say that they have completely understood the implications of it? 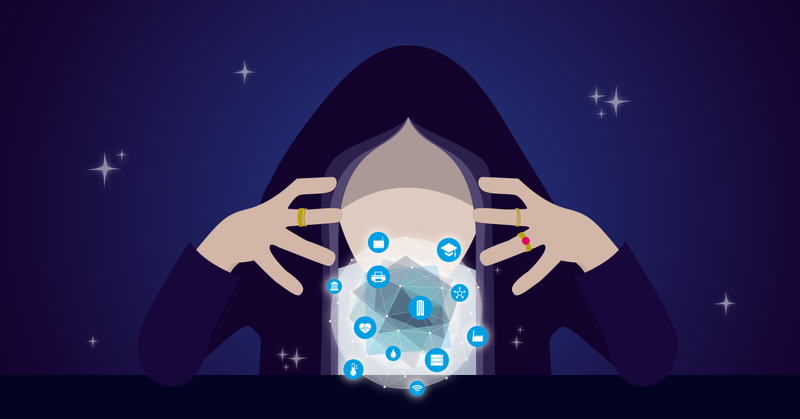 Above all, the search for strategic IoT trends resembles looking into the crystal ball of a creepy old lady with dubious facial hair and a cat on her left shoulder. But we have seen how other IT and Internet trends have behaved in recent years and even decades ago. Logical conclusions can be drawn from this about how IoT trends could behave over the next 3 to 5 years. So let's map out together the 5 most exciting strategic IoT trends for the coming years. Great, in this article you have a super hyped keyword (IoT) and the next super hyped keyword (AI) used together. Nevertheless, you cannot have it any other way. Analysts from Gartner predict that by 2019 almost 16 billion "networked things" will be in use; by 2021 the number is expected to rise to almost 30 billion. This is accompanied by an unbelievable and perhaps even unmanageable volume of data. The AI technology landscape, however, is complex and pursues different goals and strategies - and this will remain so until 2025. Despite this complexity, it should be possible to achieve satisfactory results with AI in the future. As a result, according to Gartner, it is the task of innovative companies to build teams with appropriate tools and skills that can integrate AI into the IoT strategy. It is expected that AI will be applied to a variety of IoT information so that companies cannot only store this data flood, but read and also use it sensibly. It seems logical to assume that companies seeking to combine the IoT environment with intelligent data processing will secure a strategic advantage in IoT for decades to come. If you are reading the term "Infonomics" for the first time, here you will find a quick and simple explanation. According to some analysts, trading IoT data is becoming an important part of many IoT systems. The Gartner survey on IoT projects in 2017 showed that over 30 percent of respondents already sell collected data or plan to do so in the future. The Infonomics approach extends this monetization by viewing this data as strategic business value that also appears in corporate accounting. Admittedly, this is more of an economic strategy than a technical innovative approach, but according to Gartner, it is a very significant one. This is a simple formula because without sensors there is no IoT. Over the next 5 to 7 years, the sensor market will continue to evolve. According to Gartner, new sensors that support new applications and process larger bandwidths will be created, while current sensors will become more affordable. Accordingly, companies that value technical innovation in the IoT environment should make sure that their teams identify, design and develop business-relevant sensors. However, sensor specifications, especially energy consumption, are also likely to play a greater role (in the scheme of things). With novel switching regulators, batteries could power sensors for much longer, which could make both manufacturers and consumers very happy. Security in the IoT environment is as important as it is often completely neglected in this industry. Statistical surveys and analyses repeatedly show that security is the most important concern for companies using IoT systems. The strategic goal here is that innovation teams should work closely with security experts to create comprehensive and secure concepts. This is necessary because IoT hardware has often lacked such obvious security features in recent years that it can be assumed that simply nobody has dealt with this issue. Here, we do not want to point the finger at anyone, since IoT hardware was only slightly affected by attacks in the first few years. However, that has changed with the Mirai Botnet attack. IoT networks must meet a number of (sometimes even competing) requirements, including bandwidth, cost, power consumption and range. Innovation teams should not only look at 5G and the next generation of satellites among other things, but also at the manufacturers of communication devices that provide a long range with little energy. This includes Sigfox, LoRa (WAN), MIOTY and - with a view to the future - possible technologies that are only just starting out today and which might be quite big tomorrow. On our blog, you can already find a lot of information about Sigfox (among others a strategic partner of ours) and LoRa (WAN). Articles about MIOTY will soon follow. If you go to the fortune teller and a look into the glass ball shows that you have no future, then that's always bad. As far as IoT is concerned, however, everybody sees a future; only the interpretations differ from one another. The above 5 points on the future of IoT innovation are not revealed wisdom, but only my two cents. What do you think?